LB field-phone, signal generator, pair tester and much more. AP32 is an easy-to-use multipurpose test telephone for telecom technicians. It has been designed in co-operation with users to meet their practical daily work requirements. Displejs Large 2-line alphanumeric LCD with symbols and backlight. Tastatūra Silicon treated rubber 21 key keypad with tones. Savienotāji Line connector: RJ45 (includes interface to pair 1 and pair 2), Headphone connectors: 2 pcs. 3.5mm stereo jack (for 32ohm headphones). Baterijas 1 pc. 9V alkaline battery 6LR61 or similar rechargeable battery. 1. Test Telephone AP32, 1 psc. 2. 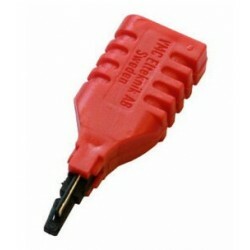 Telephone cord AP15B (1.5m, RJ45/2 x 4mm banana plugs), 1 psc. 3. Users manual in English, Finnish, Swedish, Estonian or Russian, 1 psc.